Brigadier General Herman's exceptional background, coupled with key job assignments during the course of his military service, has well prepared him for his present post as commander, Defense Construction Supply Center, Columbus, Ohio. Most of his military assignments have been administrative in nature, weighing heavily on operations. From 1943 to 1945, General Herman served as executive and later as commander of the 28th Bomb Group in the Aleutian Islands. In 1946, General Herman became A-4 of the 15th Air Force, Colorado Springs, Colorado. Following a tour of duty with the Directorate of Research and Development, Headquarters U.S. Air Force, General Herman was reassigned to Korea in August 1953 where he served as inspector general for the Fifth Air Force for a year's duration. Upon his return to the continental United States, General Herman served in the following successive assignments. Base commander, Norton Air Base, 1954 to 1955; Director of Supply and Services, San Bernardino Air Materiel Area, 1955 to 1958; Deputy director for Supply, Headquarters Air Materiel Command, 1958 to 1960; Deputy commander, San Bernardino Air Materiel Area, until June 1962; Deputy assistant director, Plans, Programs and Systems, Headquarters Defense Supply Agency, June 1962 to July 1963 from which post General Herman was subsequently assigned as commander of the Defense Construction Supply Center. The Defense Construction Supply Center is the principal source of construction materials, automotive and construction equipment, components and repair parts used by the operating forces of the four military services. During fiscal 1964, the number of items managed by the center increased from 124,000 in 38 federal supply classes to 271,000 in 98 classes. This marked increase was due to the consolidation with DCSC of functions of the former Defense Automotive Supply Center, Detroit, Mich., and the major portion of those of the former U.S. Army Mobility Support Center, Columbus, Ohio. DCSC provides the Army, Navy, Air Force and Marine Corps with a wide variety of supplies. These range from the common commercial type items such as lumber, tires and tubes, gardening implements and plumbing accessories - to complex items of mechanical, construction automotive equipment and replacement parts for military aircraft, ships and submarines, combat vehicles, and missile systems. In addition to its primary mission of providing the most effective and economical supply support to the Military Services, DCSC has another mission as one of the seven principal storage depots in the DSA integrated warehousing and distribution system. The center storage mission is very similar to a commercial warehouse operation. Large tonnages of stocks are received, stored and issued for many different owners such as other Defense Supply centers, Department of Army, Civil Defense Agency and the General Services Administration. The scope of the DCSC's mission covers a wide area of responsibility. Catalogs listing all items of supply are published for worldwide distribution to all installations of the four military services. Stock replenishment requirements of wholesale stocks are computed and purchased for delivery to principal DSA depots close to heavy concentrations of military customers and to ports of embarkation in the United States. To facilitate operations, five electronic computers and various electrical accounting machines are used to process customer requisitions, maintain perpetual inventory records, compute requirements, recommend purchase actions, and automate the center payroll and cost system. 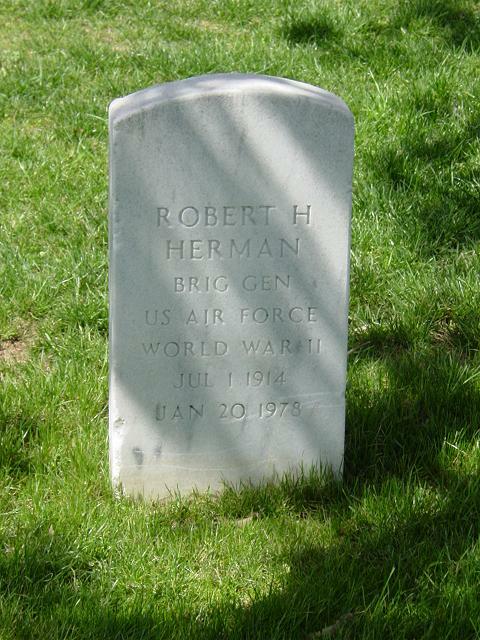 General Herman was buried with full military honors in Section 34 of Arlington National Cemetery.